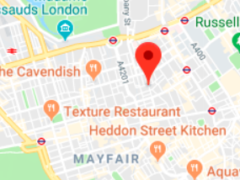 Okay, maybe you’re not quite afraid to ask, but it’s more interesting than ‘Stuff you might know about semlor but let us just tell you in case you don’t”. 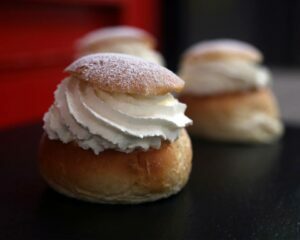 Here at ScandiKitchen, we’re always being asked about what these buns are, and why Swedes are so crazy about them. Here’s a handy 101 so you can impress your pals while you try to eat one. First of all, it’s a semla. One semla, two semlor, and so on. A semla is a cardamom bun made with yeast (yes, like a sweet bread roll, but nicer than you’re thinking right now). It’s served stuffed with very soft marzipan, a ton of whipped cream and a bit of icing sugar. A semla is a seasonal bun, served around Shrove Tuesday (we call it Fat Tuesday) and then sort of pushing towards Easter a bit. And then they’re gone. 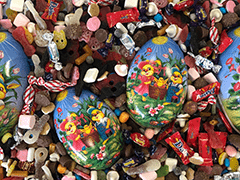 These days, most places start in January and end before Easter. 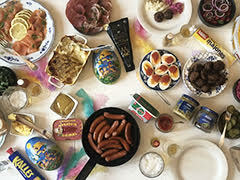 One of our Swedish friends found two semlor in a plastic tub on sale in a supermarket on 26th December, so you could say they’re a bit like a Cadbury’s Creme Egg in terms of the fury generated if they’re seen on sale too soon. Some people get really worked up about it. Scandinavians love rules and regulations for things, so Semlor have a season and can only be served during that time. In Sweden, it actually even used to be illegal to serve a semla outside of the accepted period. 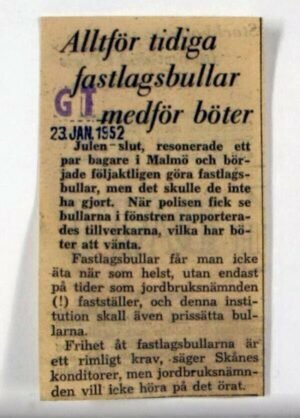 Here’s a genuine newspaper article from 1952 where the police were called to deal with some out-of- time semlor. Besides the threat of bun-jail? A semla is cream and marzipan in a bun, so it’s delicious. It’s quite heavy and makes you feel all ouuuuahhhh inside, as if you’ve just shoved two fingers up at your diet. So it’s an excellent way to celebrate the end of January. How do you eat one? There are FOUR ways. Four. Your basic method is to lick the lid and use it to scoop the cream, then eat the bun. When you feel more confident, eat the lid first then stuff your face and get cream on your nose and in your left nostril. Your fourth method is the most important one: shove it in your face. Inhale it. Around 20m (yes, million) are sold in Sweden each year. This doesn’t quite add up with the other statistic (see sweden.se for more) that the average Swede consumes five semlor from a bakery each year, because that would mean 45m buns per year, plus the homemade ones. Millions of buns. Billions of calories. 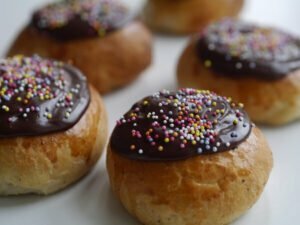 On Shrove Tuesday (called Fettisdag in Sweden, which literally means ‘Mardi Gras’ or Fat Tuesday to us), six million semlor are sold in Sweden alone. Why would a cream bun be dangerous? Well, it turns out that a semla is Scandinavia’s sort-of answer to Japanese fugu fish. 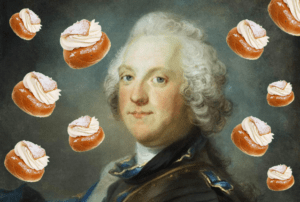 A former king of Sweden did die after eating too many semlor. King Adolf Fredrik decided to follow a banquet of lobster and champagne with 14 semlor in 1771. Cause of death: indigestion. Can I make them at home? Of course you can. Here’s a great recipe. And that also means you can eat 3 of them in one sitting and nobody will know, only you may need to wear pants with stretchy waist band for a while if you over do it. Also, you can make them in October and you won’t go to jail. 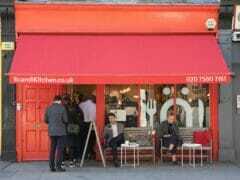 I can’t be bothered to bake today, can I get them at ScandiKitchen? Did anyone ever make a big huge semla? Someone in Sweden baked a 160kg semla in 2001, fact fiend. 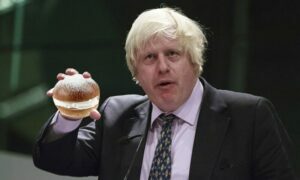 Does Boris Johnson like semlor? Yes, we think so. This may be photo-shopped, or it may not. Who knows. And frankly, who cares? Look, it’s Bun Boris. Are there any famous people called Semla? Yes, Semla Hayak, Semla Blair and Semla Norén. Måns Semlalöv. Many people love the Semlas. Sorry, Semlor. Yes. Also, if you bring your loved one semlor, they will love you even more. It’s a little known fact. Try it. Can I get other varieties? Yes, it’s actually becoming a Swedish sport to come up with different varieties. Last year, someone even made a semla-flavour water. And semla flavoured beer. And Nacho Semlor. 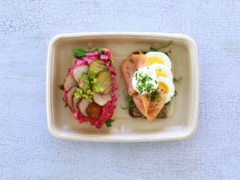 Here at ScandiKitchen, we created 15 different kinds last year – read all about them here. Keep an eye on our social media for when they’ll be on sale. 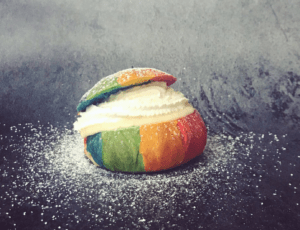 ScandiKitchen’s 2018 Pride Semla. We were proud of that one. *Okay, we may have made that bit up about Finland.